The condo is very spacious, having 2 bedrooms (with Queen sized beds) and 2 bathrooms (with marble countertops), over 1000 sq ft with a full kitchen (with granite countertops), and living room with sofabed. AC cooled and insuite hot water tank for guaranteed hot water. Very conveniently located right at the marina in downtown Cabo San Lucas (adjacent to Plaza Nautica), within walking distance of every major attraction including swimming with the dolphins at Cabo Dolphins, the luxury shopping mall Puerto Paraiso, the fantastic Medano beach, and the best clubs such as Cabo Wabo, Giggling Marlin, El Squid Roe and Nowhere Bar. In the Tesoro Resort mall and on the immediate adjacent marina boadwalk you can arrange for all kinds of water activities, including snorkeling, scuba, parasailing, submarining, water skiing, and fishing charters, all of which can depart within two minutes from the condo. Magical, mesmerizing Los Cabos, where the Pacific crashes into the Sea of Cortés at Land’s End “El Arco” while the party goes on. Following your arrival at the San Jose del Cabo airport (SJD), you can take a 40 minute shuttle van ride through or past San Jose del Cabo, then along the Cabo corridor and down to Cabo San Lucas. This whole area is referred to as Los Cabos, but at our condo you are squarely in the center of all the action at the Tesoro Hotel complex in which our condo is located and where those in the know flock to bask in the sun and have some serious Mexican fun. Los Cabos will show anyone a good time. Choose from the endless activities of this treasured area and make your vacation as relaxing or exciting as you desire. These condos are owner-operated separate from the Tesoro Hotel - parking available for extra $$ fee. Jim Thatcher enjoys the spectacular scenery at Cabo! Cabo has a sunny, dry climate with beautiful beaches and a variety of recreational activities for vacations. 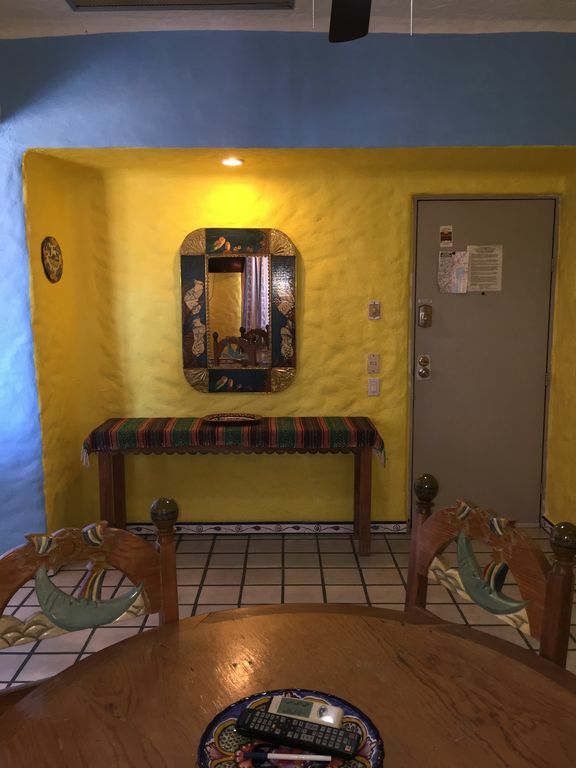 The condo is located in the middle of the action, close to nearly everything you may want to see and do in Cabo, and our budget accommodations are among the best priced in Cabo! At the marina downtown Cabo San Lucas. Great time. No spring breakers. Minutes from the boat we fished on. We really enjoyed our stay. The condo was exactly as described, clean and all the instructions and information give to us before was a great help. The property manager was very nice and helpful as well. Loved having two bathrooms. The deck was nice to sit out and enjoy the afternoon sun. Great location, being right on the marina and close walking distance to the beach, mall and markets . The highlight of our trip was the sunset boat tour. Location was awesome. Right downtown where we wanted to be. The Condo itself was great. Took a few tries to find all the switches to run lights and fans, but overall we had an amazing stay. We will definitely stay here again when we are in Cabo. One thing I would hope too see next time is an umbrella out on the patio. There was a table and chairs, but if we wanted to sit outside there wasn't any shade. This would be a huge positive for us. Thanks for having us! Thank you Johnny for your review, we are glad you would stay here again! We have purchased an umbrella for the patio, so all should be good for your next visit. Hopefully all guests will put the umbrella down whenever they leave the condo or at night time - the winds can come up fast and damage an umbrella if let up. If the beach is not your thing and you prefer walking distance to a variety of restaurants, this is your place. Medano beach is an easy 20 minute walk. The locals beach at the end of the marina is about a 10 minute walk. Close to small markets for water and other basics. Bring earplugs, it can be noisy weekend nights, but all of the units at this end are equally impacted. We stayed June 30-July 5th; Was excited for the location; arrived at the condo, unfortunately there was a pool of water in the dining room; called Ana (Mgr) and she was very helpful, was the weekend - yet, she tried to get it fixed. Turned out it was the Main-AC unit in the ceiling- which had issues and the condensation was pooling up and falling into the condo from the ceiling. Had no Main-AC throughout our stay...since the repairmen would need some time and space to work, they decided to do it after we left. The Split-AC in the MasterBR worked and the 4 of us were able to make a go of it by leaving the MBR door open. We were tired enough most nights! The kitchen is very basic - as are the pots/pans (we bought a non-stick pan & left it for the next tenants- you are welcome:-); Nice big fridge, 4 burner stove, nice ceramic plates, silverware etc.The location is unbeatable - great access to the downtown area and the better restaurants- we felt these were more authentic and not the touristy kind! The marina is in your backyard for all water related activities. Ana is extremely helpful....we booked all our activities through her...and we not only saved good money, we also got a full-refund, when one of us became sick and couldn't go....Thank You very much for all your help, Ana! A general piece of advise: Try to take pesos from your bank in US - the exchange rate I got was good; we found the rate at the nearby Casas de Cambien not very good. Also, ask for the prices in pesos...they always quote you $ prices...in many instances, it is much cheaper in pesos. Quick shout-out to "Tacos Gus"....we went there 3 times! Our family loved visiting this property. The location made it easy to get to anything desired by any age....nightlife, nice dinner, marina, Medano beach, Dairy Queen, the bus stop and the Pariso mall. It fit our family perfectly. It was clean, WiFi and Air conditioning worked, beds were very comfortable and lots of room. Having two bathrooms was the best! Anna had everything prepared for us and the entry was seamless. It is up one flight of stairs which made it even more spectacular in the mornings looking out to the marina just steps away.. Having the deck to take in the comfortable evenings was a nice way to end the event filled days. Downtown on the Marina: No need for car rental or taxis, you are at the centre of it all, a superb location for, and only a few minutes walk to the best restaurants and shopping, with lunch/snorkelling cruises past El Arco up the Sea of Cortez to Santa Maria Bay or Chilean Bay, and dinner/sunset cruises around El Arco up the Pacific ocean, and fishing charters, all essentially leaving from your doorstep on the marina! You can take a leisurely 20 minute stroll around the beautiful marina walkway to the fabulous Medano beach (which is great for swimming and water sports such as waverunner/jetskis and parasailing) while taking in the sights, including the ultra luxurious Puerto Paraiso Mall. And from our condo you are only 5 to 8 minutes walk to the best clubs, including Cabo Wabo, No Where Bar, Giggling Marlin and El Squid Roe. Walk 2 minutes around the corner for 'Swim with the Dolphins'. Be picked up downstairs for adventure excursions on ATVs, Baja dune buggies, Zip Lines, or to Cerritos beach for a day trip of boggie boarding and surfing. The Los Cabos Country Club Golf Course is only 2 miles away.